Note: the page numbers given refer to the 1847/48 volume of the Truth Tester held in the library of the Vegetarian Society UK. This incorporated two other journals, The Temperance Advocate and The Healthian. None of the individual issues are dated but they appear to run from August 1846 to July 1848, as issue 6 mentions the 'new year'. The front covers were not included and the title page merely says 'New Series, Vol. 1, 1847', then 'Vol. 2, 1848'. Vegetarian Friends, - The period fixed for the adjourned Vegetarian Conference being at hand . . . The formation of societies may be either positive or negative in their operation . . . In the formation of a society of vegetarian, it is to be hoped, however, . . . to secure the practical benefits of improved habits of diet to society generally. (again continued at some length) Yours faithfully, James Simpson Jun. Great Malvern, Thursday Sept. 9, 1847. 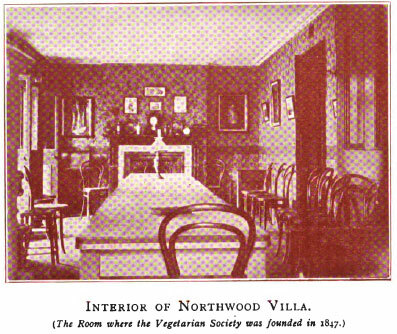 The adjourned meeting of the Conference of Vegetarians met, pursuant to public announcement, at the Hydropathic Institution, Northwood Villa, a delightful spot near Ramsgate, on Thursday, Sept. 30, 1847. And altho' at the remote south-eastern corner of England, it was attended by many zealous, influential and eloquent friends of the cause, from various parts, some of whom had travelled not less than 300 miles to be present. Most of the friends arrived on the previous afternoon and evening. The meeting, which was presided over by Joseph Brotherton, Esq., M.P. for Salford, was one of no ordinary occurrence. Nine of those present have abstained from flesh and alcohol for upwards of 30, most of them 38 years. They all looked truly patriarchal, healthy, strong, and full of intelligence and love. Most of our readers are aware that the object of the Conference was the formation of a society for the purpose of promulgating advanced knowledge on the subject of diet, and particularly the reasons for, and the advantages and duty of, abstinence from the flesh of animals as food. The objects of this society are to induce habits of abstinence from the flesh of animals as food, by the dissemination of information upon the subject by means of tracts, essays, and lectures, proving the many advantages of a physical, intellectual, and moral character, resulting from vegetarian habits of diet; and thus to secure, through the association, example, and efforts of its members, the adoption of a principle which will tend essentially to true civilisation, to universal brotherhood, and to the increase of human happiness generally. The morning was devoted to preliminary arrangements, reading correspondence, discussing rules for the Vegetarian Society, and the formation of the society, which was joined by upwards of 150 persons. The company partook of dinner at half-past 1 o'clock, a particular account of which, with some of the recipes, we intend giving in our next number. We intended to have given a full report of the proceedings, together with abstracts from the speeches of the various speakers, in the present number, but have declined doing so in consequence of its having been thought preferable to give the whole report in a supplementary number of the Truth-Tester, which will be ready for delivery by the 22nd inst., price 2d. "I hereby declare that I have abstained from the flesh of animals as food, for the space of one month and upwards, and that I desire to become a member of the Vegetarian Society, and to co-operate with that body in promulgating the knowledge of the advantages of a vegetarian diet." 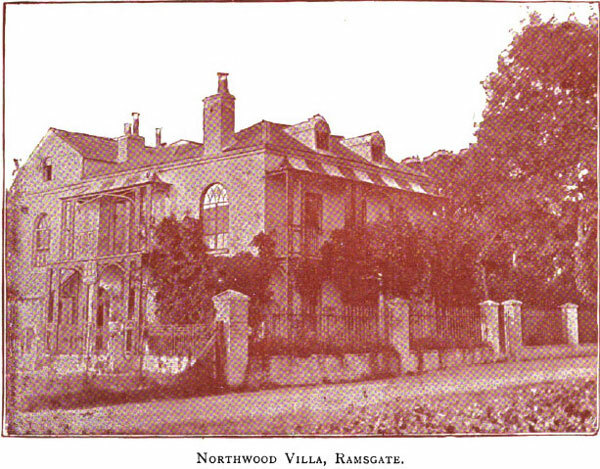 The above declaration may be made by any person (male or female) above 14 years of age, to some neighboring member of the society, or by letter to the secretary, W. Horsell, Northwood Villa, Ramsgate, by either of whom it may be attested.